You may be working your way toward 50 years of marriage, a “golden jubilee” anniversary. But what about 50 years of working at your job?! That’s what Father Peter Gorges is celebrating next week in Sitka — 50 years of priesthood. Father Peter Gorges calls Sitka home now. But one of the state’s most itinerant Catholic priests wasn’t always an Alaskan. After college, Gorges worked as an auditor at a bank in the city. One summer, he moved to Ohio to get his hands dirty working on a farm. But a future in the seminary still wasn’t on his mind. Then he was drafted by the U.S. Army in 1957 and sent to Anchorage to become a chaplain’s assistant. He was assigned to Wildwood Station in Kenai, his first experience with Mass in Alaskan conditions. Gorges realized they needed help. After his service was complete, he went to St. John Seminary in Boston. He was ordained in 1967 in Juneau, traveling across Southeast, working first in Hoonah, Pelican and Gustavus . 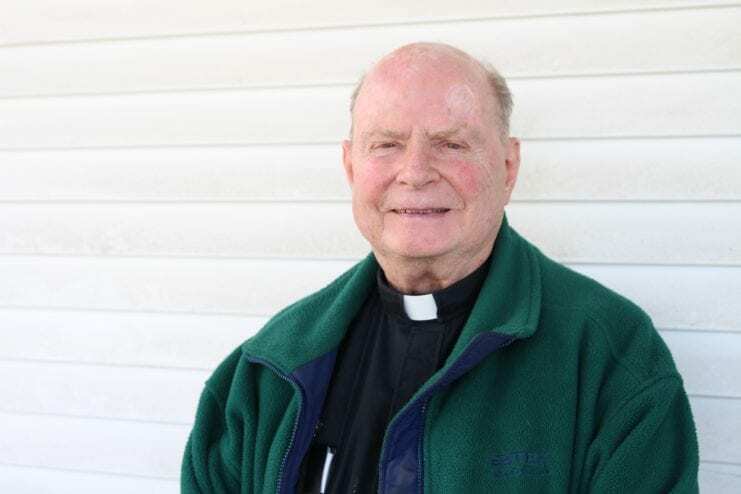 He’s worked as a priest in churches across the state, such as St. Paul the Apostle in Juneau , Our Lady of Guadalupe in Anchorage, and parishes Fairbanks, Palmer, Kenai and all over Southeast. He came to Sitka in 1999 and was pastor here until 2001. Then he ‘retired.’ But not really. He became, essentially, a substitute priest, traveling all over Southeast, even up to Anchorage and Fairbanks to fill in when churches needed help. He says not much about the church has changed. Young and old, parishioners come and go, and the church continues to serve the community. But, the busy traveler he is, he has noticed something different in Sitka. One social event he won’t be missing? His “Golden Jubilee” mass celebrating 50 years in the priesthood. The Golden Jubilee Mass for Fr. Peter Gorges will be held at 5:00 p.m. Tuesday, May 29, at St. Gregory’s Catholic Church.